Corpse-ID is designed to identify dead (or unconscious) bodies, i.e. where the eyes are closed. It is a separate but fully integrated capability within the f2 Image Recognition Suite. It can work even if the face is significantly damaged. Closed eyes are an issue because all face recognition systems place much value on the area around the eyes due to the clear edges and high contrast of the features there. 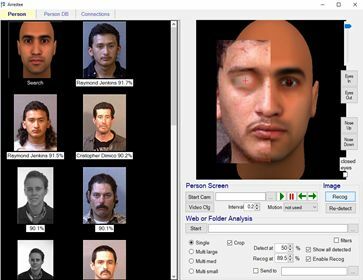 If both eyeballs are not visible the recognition performance of almost all face recognition systems can be severely degraded or not work at all, as the eyeballs are the key anchor points around which the characteristics of numerous facial features are measured. The original design of f2 included the unique ability to match a selected part of a face, and to apply different weightings to different areas, making it possible to match only the selected part, and thus work with closed eyes and damaged faces. In partial mode Corpse-ID can work with two eyes (i.e. mailbox or balaclava view), one eye, and sometimes with no eyes at all. 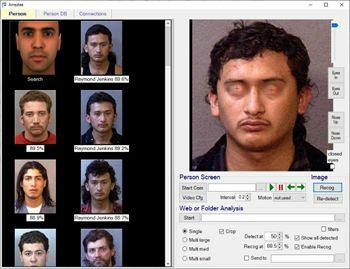 In the above example the closed-eye face to be searched is copied into the box on the right, the eye centers are set manually, and the top matches are displayed as thumbnail images on the left. As with all biometrics, face recognition systems require a database of images to match against. In the case of corpses this database will generally be specially created following a particular disaster such as a boat sinking, tsunami, earthquake, etc, with pictures provided by concerned family members and friends. Multiple photos of an individual can be held in the database. When a victim is found an investigator will take several photos of their face. If the eyes are both visible and open the face can be matched immediately against the database. If the eyes are closed or the face is damaged it will be positioned over a generic facial template and the eye locations will be set manually. Each of the shots will be encoded and matched against the encodings of all the faces in the database. Thumbnail images of matches above a user-defined threshold will be displayed for investigators to compare. Text filters, e.g. on gender, can be used to narrow down the number of potential matches where appropriate, for example where a face is heavily damaged and a number of distinguishing features are not visible.